Today, I have a real treat in store for you: an interview with the brilliant and hilarious Jamie Michalak, and a GIVEAWAY of a signed copy of her latest book, Joe and Sparky Go to School, which goes on sale today! Jamie’s the author of two other books about these offbeat giraffe and turtle buddies, Joe and Sparky Get New Wheels and Joe and Sparky Superstars, as well as numerous other books for young readers. So, how did you come up with these two characters—a delicious odd couple if ever there was one— in the first place? Oh, thanks! I wrote a rough draft of the first book in the series, JOE AND SPARKY GET NEW WHEELS, with my younger sister, so I think we unconsciously based the two characters on our personalities. She was the fun-loving unpredictable Joe Giraffe, and I, being the older sister, was more like the cautious Sparky Turtle telling her to slow down. Like Joe and Sparky, we had many adventures together–dancing, telling jokes, and driving in cars to malls and drive-throughs. What new adventures might Joe and Sparky have up their sleeves? Well, the students I’ve meet at school visits have given me many ideas, such as JOE AND SPARKY GET ATTACKED BY A SHARK, JOE AND SPARKY MEET LUKE SKYWALKER, and JOE AND SPARKY ON THE TITANIC. So those are solid. But I’m cooking up one right now that gives Wiggy, Joe’s pet worm, a bigger role. Is he real? Is he imaginary? Questions will be answered. Do your own kids provide any inspiration when it comes to Joe and Sparky? YES! I have two boys–ages 9 and 7–and they’re constantly giving me ideas for stories. In fact, they’d been asking me for years to write a scene about Joe and Sparky in a bathroom. So in JOE AND SPARKY GO TO SCHOOL, Joe and Sparky now spend an entire chapter having a ball in the boys’ bathroom–making toilet paper scarves, taking a bath in the sink, and discovering that schools have a magic pond. How did you come up with all of the wonderful elementary school jargon for Joe and Sparky’s visit to school? Don’t you just love the sayings teachers use? I asked a group of my teacher friends for their suggestions. They provided all of the sayings that appear in the book. “Clap your hands, stomp your feet, put your bottom in your seat!” is my favorite. One sassy saying that didn’t make it in is “A little dab will do ya, a lot of it will glue ya.” Lots of possible scenarios there! Your stories and Frank Remkiewicz’s pictures seem like a slam-dunk marriage of words and art. What’s it like to work with him? Have you ever had a chance to meet him? I love Frank! He’s a super talented illustrator with a brilliant sense of humor, so it’s been a dream to work with him. I always love seeing how he will extend the text with visual jokes. Plus, it’s kind of amazing that he was able to squeeze a giraffe behind the wheel of a convertible. That can’t be easy. Sadly, Frank and I have never met, but we’re pen pals. You do a lot of school visits. Do you ever have kids tell you that they identify with Joe or Sparky? Oh, yes. The class is usually split 50/50. The students I’ve met during my school visits actually inspired JOE AND SPARKY GO TO SCHOOL. While speaking, I looked out at the audience and wondered what it would be like if Joe and Sparky were sitting there. What would they do if they spent the day with the kids? What sort of trouble would they get into? As it turns out, LOTS. I took the Joe and Sparky personality test recently (I’m a Joe!). Have you ever taken it yourself? Are you a Joe or a Sparky yourself? Of course, you are a Joe! You were Carmen Miranda for Halloween. Joe loves his fruit hats. According to the personality test, I’m a little like Joe and a little like Sparky. That makes sense. I’m a horrible driver and enjoy road trips and sport socks like Joe; but like Sparky, I have been known to hide in my shell and avoid the Hokey Pokey. I’d rather not shake my leg all about, if I can help it. How do you stay focused and motivated when you’re seeking new adventures for these characters? Gah. I don’t. For me, the best way to come up with an idea for a story is to not try. I write other stories, eat Doritos, go for a run, take a shower–that’s when I’ll get an idea. Finally, any pearls of wisdom for writers who are trying to write early chapter books? Are there any resources you found to be particularly useful? Read, read, read every chapter book you can get your hands on. Pay attention to what works and what doesn’t work. Make sure you don’t overdo it with the dialogue–an illustrator will need some action to draw. Write for yourself first. In other words, tune out your inner critic and write for fun–like you did when you were little. If you can make yourself laugh, chances are that you’ll make your reader laugh. So, you might be asking, how do I enter to win a signed copy of Joe and Sparky Go to School? 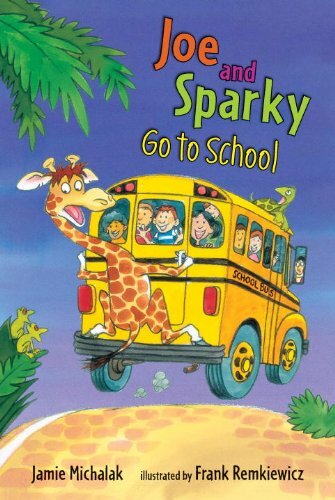 Well, just leave a comment with the name of your favorite teacher in it, or tweet it with #joeandsparkycontest by Saturday, June 15th at noon (EST). If you want to learn more about Jamie and her superstar books, mosey on over to her website. And be sure to check out the book trailer for this awesome new book! Mrs. Ward was my favorite teacher in Elementary School. Something about 1st grade teachers… my girls loved their 1st grade teacher too. My favorite teacher was my third and fifth grade teacher, Sr. Eleanor from Immaculate Heart of Mary school in Wayne, NJ.